For those of you praying for Honda to make the CRX again you got your wish… sort of. With things like Eco-mode, idle stop, and an electric motor, this sounds like another bad case of the Insights. (get it?) But wait, there’s more. 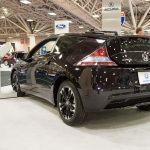 Honda has always been known for making small, fuel efficient cars that can also rev to a million rpms to offer a little fun but the 2014 Honda CRZ takes both ends of the spectrum to the next level. On the Eco side, this car is extremely small, light, and has a 1.5 liter engine that pairs with an electric motor. You can push the green “ECON” button and you will get a car that has zero emissions, turns off at stop lights, and you can get up to 39 mpgs if you drive efficiently. Hit the Sport Plus (S+) and it becomes a new car. You’ll have access to the electric motor which will work in conjunction with the 130 VTEC horses and you’ll get sharper steering. Although it’s no McLaren P1, it is utilizing the same type of technology to make a faster and more efficient car! Long story short, I can’t wait to drive one. The exterior is fantastic (especially in this dark purple), the interior makes you feel like you’re in a jet fighter, and it’s practical with a relatively large hatch to put stuff in. The 2014 Honda CRZ starts at $23,000 and I won’t even be mad if I see the streets littered with them!